First hunt of the season as MZ came in here in TN so I was there, albeit too early and had to sit and wait in car for legal time. It'd rain all day Friday but promised to dawn clear and slightly chilly. I got there, waited till closer to legal time and then got my gear and paraphernalia on. 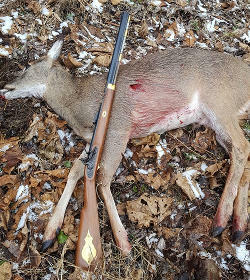 Ran into a younger chap hunting with a bow who when he saw the gun, said, "I don't like guns much" then saw it was a flinter and added, "Now THAT is a real gun!" Neither of us saw deer or fresh sign... younger gent has scouted that WMA hard and says he believes, as do I, the deer just travel thru or are few and far between... I'm not sure which... but it was safe to say it was a good day to be afield! Nice time out there, and who knows as age creeps in how many there'll be? Being there really is good enough some days.Especially when the weather is perfect. I'll be there at the end of this week.Been a year since I been in any woods. Well David, you can't get them sitting on your couch! Any time spent in God's creation is a gift that should be cherished!!!! Yes, is always great to see game, but it's fun just being out amongst it as well! That was the intent of my original post, all the goof ups included it was good to be out there... Can't say I'm drawn to race out to do it again... for the reasons I expounded upon in my reply to Richard (aka VTman). But ones soul needs it time to time... not like it used to be but then I don't last as long doing those wonderful things I used to do all day long. I spent most of yesterday evening once home and chores done and gun cleaned, on a heating pad... these old bones no longer cotton to sitting in the cold like I once did! I think the statement I parroted, "Being there was good enough" means (to me) I don't need to kill game to enjoy the outing, but i do like seeing critters when out, alas, I knew my home territory and now...not so much... :(So I just go to smell the fall woods! For that, it was a perfect outing minus the aching lower back that is still giving me fits! IIRC, there was a popular song like that back when I used to do the bump n grind with cute co-eds! I remember dancing to it long after 61', but hey, what's memory at this point anymore? The Oldies lasted a good long time...not like this stuff that assaults my ears these days... But that name of the group rings a few chimes!